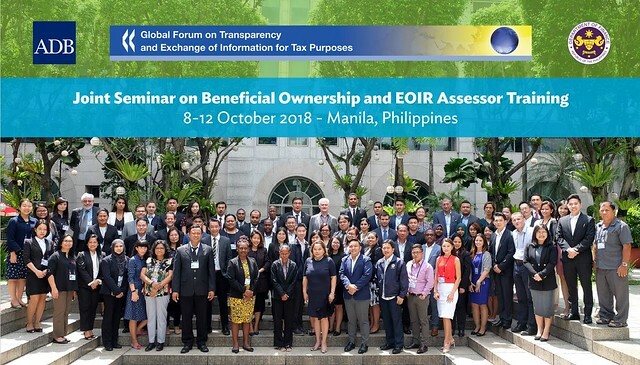 12/10/2018 - The Global Forum on Transparency and Exchange of Information for Tax Purposes (the Global Forum) and the Asian Development Bank (ADB) jointly held a seminar on Beneficial Ownership (BO) and the implementation of the international standard for the Exchange of Information on Request (EOIR) on 8-12 October in Manila, Philippines. The seminar was attended by 71 delegates from 27 countries. Ensuring the availability beneficial ownership information is at the forefront of the international agenda on tax transparency and is an vital part of the international standards of transparency and exchange of information for tax purposes (both automatic and on request). The seminar was aimed at building awareness on the beneficial ownership transparency requirements in the exchange of information standard and the coordination between the various stakeholders at the national and international level. The second part of the seminar was designed to help countries understand how to plan and participate in an EOIR peer review as a Global Forum assessor. The seminar prepared attendees to meet technical demands put on assessors through practical exercises to aid comprehension. The seminar also provided a valuable learning opportunity for jurisdictions preparing for their own peer reviews. Countries present recognised the common necessity to meet the BO requirements, for tax other purposes (e.g. AML and anti-corruption). With the help of experts from the Global Forum Secretariat and the ADB, delegates discussed the policy, legal, regulatory and institutional requirements of ensuring the availability of beneficial ownership information. Bringing tax and other officials together is central to the Global Forum’s work and the meeting also allowed partipants to extend their network of contacts in other tax administration and Finance Ministries.